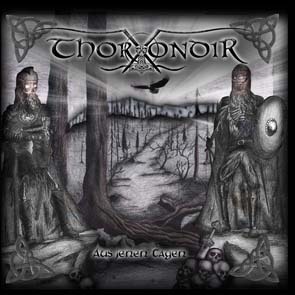 The Epic-Pagan-Metal Band THORONDIR from Waldsassen (Bavaria) was formed on the 15th of July 2007 by the musicians Kevin Wienerl (Vocals), Dominik Hautmann (Rhythm Guitar), Alexander Göhl (Drums), Michael Ney (Lead Guitar), Fabian Wienerl (Keys/Synthesizer), Christopher Zeus (Bass). Due to a long lasting search for a rehearsal room the beginning compositions could only be done in the winter of the same year, which led to the fact, that the band could only have their stage debut in spring of the forthcoming year. After several successful live acts in the Oberpfalz (Bavaria) the band decided to venture the next step and record their first album Düsterwald". Shortly after their bass guitar player Christopher Zeus left the formation due to personal reasons. But it didn't last long until Florian Striegl joined the band. This new entrant aroused new power and passion in the members and finally led them to sign a recording contract with the Austrian label CCP-Records". The musical concept is based on the scoring of the mythology of old Germanic/Nordic culture as well as their morals and traditions. For this reason the lyrics of THORONDIR consist of legends of the gods and the battles of the past but also about the beauty and perfection of the nature. Musically THORONDIR distinguishes itself mainly because of melodic guitar sounds highlighted by gentle keyboard melodies. To illustrate the massive and bloody battles in the lyrics the band uses the particularities of classical death metal by applying hard slowriffs and fast drumbeats. The epic aspect is expressed through mystical and folkloric keyboard accompaniment. The singing combines the high screaming of black metal and the deep growling of death metal with hymn-like men singing, which gives the whole a particular touch. The music of THORONDIR has been influenced by the following artists: Ensiferum, Falkenbach, Equilibrium as well as other bands from this genre. 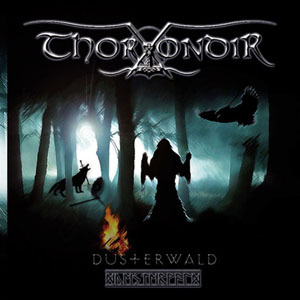 The Epic-Pagan-Metal Band THORONDIR from Waldsassen (Bavaria) was formed on the 15th of July 2007 by the musicians Kevin Wienerl (Vocals), Dominik Hautmann (Rhythm Guitar), Alexander Göhl (Drums), Michael Ney (Lead Guitar), Fabian Wienerl (Keys/Synthesizer), Christopher Zeus (Bass). Due to a long lasting search for a rehearsal room the beginning compositions could only be done in the winter of the same year, which led to the fact, that the band could only have their stage debut in spring of the forthcoming year. After several successful live acts in the Oberpfalz (Bavaria) the band decided to venture the next step and record their first album „Düsterwald“. Shortly after their bass guitar player Christopher Zeus left the formation due to personal reasons. But it didn’t last long until Florian Striegl joined the band. This new entrant aroused new power and passion in the members and finally led them to sign a recording contract with the Austrian label „CCP-Records“.